It's time for the awards ceremony now. My, you all look so stunning! Is that Jon Bon Jovi over there on the red carpet? HEY - where'd you all go??? I'm the one giving the awards! Geesh! 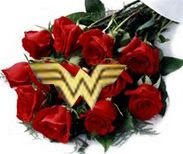 The first award we have today is the beautiful Wonder Woman award. Just look at how amazing this award is. The recipients are just that too - Amazing! Yes, I'll be wearing my Wonder Woman outfit as I lovingly pick out a place on my sidebar to put this beauty. LMQ at Tales of the Lawn Mower Queen - One of my very best friends evahhh! She picks me up when I am sad, depressed, or downright ticked off. She has the fabulous ability of always having the perfect thing to say. She has overcome some of her own obstacles, but those obstacles were unable to destroy her spirit. She is one of the greatest people I have ever met. I wish I could also give this award to her mom, the previously mentioned Aunt J in this post. If you read that post, you will know why Aunt J is my Wonder Woman too - she definitely passed her talents on to her daughter. Tammy at Mom Knows Everything - the only woman I know who puts endless time and effort into making not one, not two, but three Halloween costumes for her child, who refuses to wear any of them now. She is truly a Wonder Woman in my book and has become one of my best friends. Stacy at JameeForever - This woman is a loving wife, completely devoted to God, and the mother of three gorgeous children, one of which she home schools. She also stays up until the wee hours of the morning completing the work that she does from home. Yes, she truly is a Wonder Woman. Linda at Are We There Yet - She is a dispatcher, a mother, and the assistant to creating really cool plushies. When a long-awaited for concert is canceled, she plans a whole day of doing something that she doesn't enjoy, just to lift her daughter's spirits. I think she deserves a Wonder Woman plushie, but I don't know how to make them, so I'm giving her this award instead. GiGi at Girl Gone Wild (Bible Style) - Not only is she a wife and a mother, but she has the fabulous talent of making me crack up laughing even when I previously felt like crying. If I had a dime for every time this woman made Dr. Pepper come out my nose, I'd be rich. She truly is a Wonder Woman to me, because when I'm down in the dumps, she and her blog posts come swooping in with magical powers to pick me up out of my slump and send me on my way again. Janice at Twist & Skewer - She has overcome many obstacles, and she still manages to keep the sarcastic humor and ability to say it like it is that I have come to love about her. There are so many things I could say about Janice, but simply saying she truly is a Wonder Woman sums it all up! The next award is the Community Blogger Award. This is a tough one for me to give out, because I want to give it to everyone. I mean, you ALL make my blogging community a better place, and you all welcomed me here with open arms. So, I'm not going to pick and choose. I just can't. I have over 70 blogs that I have subscribed to in my reader, and that I read on a regular basis (a bit obsessive? Nah). I cannot with a clean conscience pick and choose just a few. Therefore, if you are a regular reader of my blog, well, you truly make my blogging life better, so please, add this award to your sidebar. Misty you are such a sweetheart! I am so glad that we became friends. you definitely deserve these awards!!! Congrats Misty! You deserve it! Thank you so very much for this award, that was so sweet of you! I am honored! And humbled, too! Congrats on the awards Misty--you truly deserve them--you blogging queen, you!! I hope you are having a wonderful weekend and taking lots of great pictures! Thanks Mist my dear! I must say I have to go over and meet the Halloween costume mom, that's a hoot! GiGi (Girl Gone Wild) is that and a box of cookies! Isn't she crazy? I love and adore all things Gi. Misty~you deserve the awards. Tahnks for passing them on. I feel like I haven't been the best blogger with so much schoolwork to do. ACK! I should be studyong now. Love you. You are a fantastic friend and woman!! HUGS! I Don't Know What To Do - I'm SO Mad! It's All On My Homepage! Did He Grow Up Under A Rock? I NEED A Basement NOW! This Is MY Kind Of Contest!